Strikes and protests aimed at disrupting the retail giant Walmart during next week’s Black Friday sales events began on Thursday with walk-outs at a number of stores and the promise of more actions in the lead-up to what is traditionally the busiest shopping day of the year. The news comes amid controversy about plans by Walmart and other large chains to open on Thanksgiving evening, kicking off Black Friday a day early. It also comes as another strike has hit part of Walmart’s warehouse supply chain in southern California. At least 30 workers from six different Seattle-area Walmarts have gone on strike, organisers and Walmart staff from the OUR Walmart group said. The group, which is not a union but has close ties with the labour movement, is seeking to protest what it says is low pay, too few hours and retaliation by managers against workers who speak out. Outside a Walmart distribution center in Mira Loma, Calif. yesterday, a few dozen striking workers were joined by throngs of chanting supporters to protest alleged retaliation against workers who complained about safety hazards. Today, hundreds of supporters joined them at the warehouse, where law enforcement officers arrested six community leaders for acts of non-violent civil disobedience. Among those arrested was a local clergyman who sat down in the road in front of the warehouse, temporarily blocking trucks approaching the loading docks. The strike is one of more than a thousand protests, walkouts, and other actions workers in the Walmart retail empire are planning over the next week, culminating on the big “Black Friday” shopping day. After an initial round of lengthy warehouse strikes and quick retail strikes in late September, a new surge started with one store in Richmond, Calif.; then three stores last week in Dallas. Yesterday, workers walked out at one store in San Leandro, Calif., followed today by workers at six stores in Seattle. Strikers at the southern California warehouse allege that the staffing agency Warestaff retaliated against participants in a two-week strike over safety issues in late September and early October. 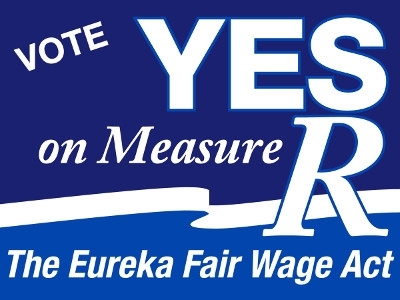 According to Warehouse Workers United (a workers’ center in the Inland Empire complex of southern California distribution centers), Warestaff has shortened many strikers’ work weeks from the usual 30 to 40 hours down to as little as 8 hours, even as it hires new workers. Organizers believe Warestaff was acting under orders from Walmart; Warestaff is contracted by NFI Transportation, which operates the giant Mira Loma transportation hub exclusively for Walmart. Yesterday’s strike was launched a day early in response to what organizers saw as a new round of retaliation by Warestaff. On Monday, Warestaff sent a large group of workers home early, even though workers estimated there was a sizeable line-up of 150 trailers that needed unloading. Then the company told most of the strike cadre to stay home Tuesday. When they learned about the lost workday, the core of the strike leaders decided to start their walkout a day early but to continue with a strike and supporter rally on Thursday. A September full of direct action and progress for workers’ rights group Warehouse Workers United (WWU) came at a high cost for the outspoken David Garcia. Garcia—a father of five sons who already struggles to make ends meet when duly employed—was among the dozen on-strike Walmart-subcontracted employees at NFI Industries in Mira Loma who picketed and participated in a 50-mile, six-day march from the Inland Empire to Downtown Los Angeles last month. 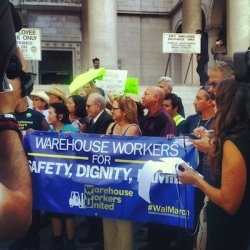 “WalMarch” brought international awareness to the ongoing plight of warehouse workers caught in a white-collar web that allows the world’s largest corporation to exploit supply chain workers through the questionable—sometimes illegal—practices of logistic firms and temporary staffing agencies. The emerging leader in the warehouse worker movement was passionate as he spoke to supporters and media before the launch of WalMarch in the WWU parking lot. Garcia told the crowd he understood the risk he is taking for speaking up, but he had determined the decision had to be made for the betterment of his future. ← “Fight for $15” Starts Today in Chicago – Retail & Fast Food Workers Organize!